Image via Wikipedia2011 was a pretty crappy year - for me, for the economy and for the world which suffered one natural disaster after another. But I had a dream this morning that indicates a better year ahead: I'm at the intersection where I must turn right to get to my health club, but the traffic light is at such a strange angle that I can't tell if it's green for me or for the traffic going the other way. Just as I realize that I HAVE THE GREEN LIGHT, I wake up...So, I'm interpreting my dream to mean that I finally have the green light to go in the RIGHT direction, not only toward good health in my body, but since my health club is named for Henry David Thoreau, one of New England's most celebrated authors, I'm headed in the right direction toward my creative health as well. You find love and tenderness in all aspects of your life. You are free of any negative influence of past traumas from this life or any other. You sleep soundly and wake refreshed. You embrace your womanhood or manhood in all its aspects and it is a source of joy and fulfillment in your life. Your body is balanced and whole. You move forward in joy without holding back. Your creativity flows freely in all aspects of your life and brings you and others great joy and fulfillment. You are safe and protected by the Divine Light at all times. Your relationships are loving, safe, sacred and engender mutual trust. You deeply love, respect, and accept yourself. Your kharma is free and clear. You give yourself up to the Divine in love and with an open heart. The leader of my FM support group sent an email link to an article in Health.com about an unproven but promising new method for treating fibromyalgia pain called Peripheral Nerve Stimulation (PNS). The treatment was recently highlighted in a local news broadcast in the Boston area. According to examiner.com, PNS is "the implanting of wire electrodes just beneath the skin of the patient’s head or lower back. The other ends of the electrodes connect to a battery-powered stimulator that delivers electrical current to the nerves." 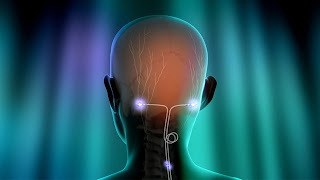 PNS, or greater occipital nerve stimulation, has already been used successfully to treat occipital neuralgia (pain in the upper neck, back of head & behind ears; sometimes the scalp, forehead, behind eyes) and various primary headache syndromes, such as migraines. The occipital nerve is located on the back of the head just above the neck area. The FDA has not yet approved this treatment for FM but it is being researched. However, there are some difficulties in establishing a control group since the electrical stimulation has physical sensations that can't be recreated as a placebo. After 15 years of battling fibromyalgia with medication and exercise, Lisa Simpson still had cramping, spasms, and pain all over her body. "Just to have my 7-pound Chihuahua walk over my legs would cause severe pain," the 37-year-old medical assistant recalls. Simpson had all but given up on finding relief when, in 2004, she saw a ray of hope. She was working in the office of an anesthesiologist at Griffin Hospital in Derby , Conn. , Mark Thimineur, M.D., who had begun surgically implanting tiny, nerve-stimulating devices into fibromyalgia patients. The treatment, known as peripheral nerve stimulation (PNS), entails implanting wire electrodes that are about 2 millimeters thick just beneath the skin of the patient's head or lower back. The electrodes, which are connected to a battery-powered stimulator, deliver a mild -- and usually imperceptible -- electrical current to certain nerves. However, up to 40 percent of the approximately 10 million fibromyalgia patients in the U.S. fall into that category, and if PNS proves beneficial, it could potentially help tens of thousands of people, without the side effects of prescription drugs. But for that to happen -- and for insurance companies to agree to foot the hefty bill (it can cost up to $90,000) -- clinical trials will need to prove its safety and efficacy. "This is on the cutting edge, or witchcraft," says Peter Staats, M.D., a pain doctor in private practice in Shrewsbury , N.J. "We haven't decided which yet." Although pain experts aren't entirely certain why PNS improves fibromyalgia symptoms, they suspect that the electricity blocks pain signals from reaching the brain by disrupting a set of nerves in the spinal cord. These nerves have "a direct connection to almost every part of your brain," says Dirk De Ridder, M.D., a neurologist in Belgium who is researching the technique. The improvement that Simpson saw is the norm rather than the exception, Dr. Thimineur says. He estimates that between 50 percent and 60 percent of his fibromyalgia patients experience a 50 percent reduction in pain (a common benchmark used to assess pain treatments), qualifying them for an implant. Mark Plazier, M.D., a neurosurgeon and colleague of Dr. De Ridder's at University Hospital Antwerp, in Belgium , says that the overall improvement in a patient's quality of life is even more impressive than the pain reduction. "They just get back into shape, back into society," he says. Dr. Thimineur decreased the current at each monthly visit, to the point where it was actually too low. Masters lost her jitters and anxiety, but her pain came back, and she felt exhausted. After a small increase, Dr. Thimineur hit upon the right level for her. She has done well ever since and can now attend her daughter's basketball games -- something she was in too much pain to do before. Joshua Greenspan, M.D., a pain specialist in private practice near Portsmouth , N.H. , has treated at least 50 fibromyalgia patients with nerve stimulation. But he says more research is needed for doctors to embrace the technique. "There has to be at least one paper with at least 100 people in it," says Dr. Greenspan, who first learned about using nerve stimulation for fibromyalgia from Dr. Thimineur. The preliminary findings -- which have not yet been accepted by a peer-reviewed journal -- are encouraging, the researchers say, and they are now conducting a similar study with 40 patients that they hope to finish next summer. Proving that peripheral nerve stimulation is superior to placebo will be necessary in order for insurance companies to agree to pay for the procedure. Currently, some insurance companies -- and in some states, Medicaid and Medicare -- cover the treatment for chronic headaches and other pain conditions, but not fibromyalgia. Simpson discontinued her regular pain drugs within two months of getting her implant, and now she only takes them to help with brief spells of "breakthrough" pain. As with many nerve-stimulation patients, her pain returns every year or so -- a signal that she needs to have her stimulator setting readjusted.